August is a complex month, a month when the country stops and, even if you want to work, it’s easy to find little setbacks. Furthermore, part of the team took a little break, making it harder to work normally. We take the opportunity to start attacking some points that sooner or later have to be done, like enhancing aspects that, although they work, are far from final quality. Jack’s animations may be the best example. Technically we would only need a “run” animation, being a game where our protagonist never stops. Maybe an “idle” animation for some special moments too, and obviously a “jump” one. Well, in fact that’s what we had until now. But enough is not enough. Adding some details should enhance your game, then, why not adding a “propel” and “landing” animation? 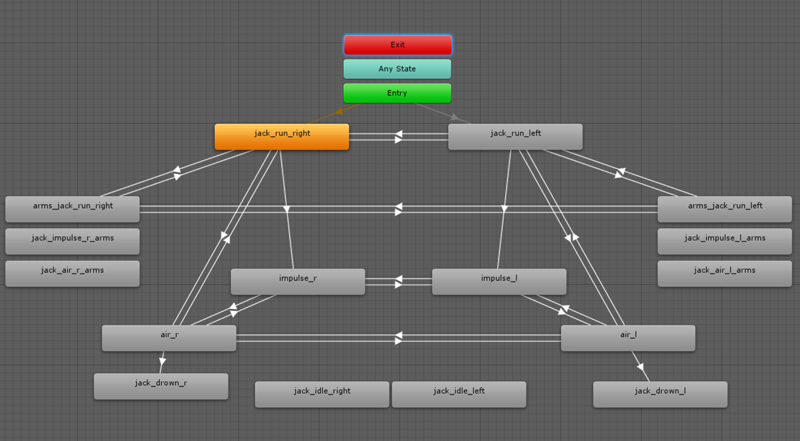 We started to work, increasing the animation tree complexity, and technically we did a good job, but what happened? The product got worse. By adding the new animations we added also extra animation play time. For example, while landing we needed to take out control from the player during these frames when the landing animation is playing. The result is that gameplay suffers because the player feels frustrated when he tries to jump quickly when landing and it does not work. If we don’t block the player’s control, then the visual effect is strange because the landing animation “cuts” before it ends. So we went back to the original animation tree, substance over looks, gameplay over aesthetics, but we kept the enhanced animations. 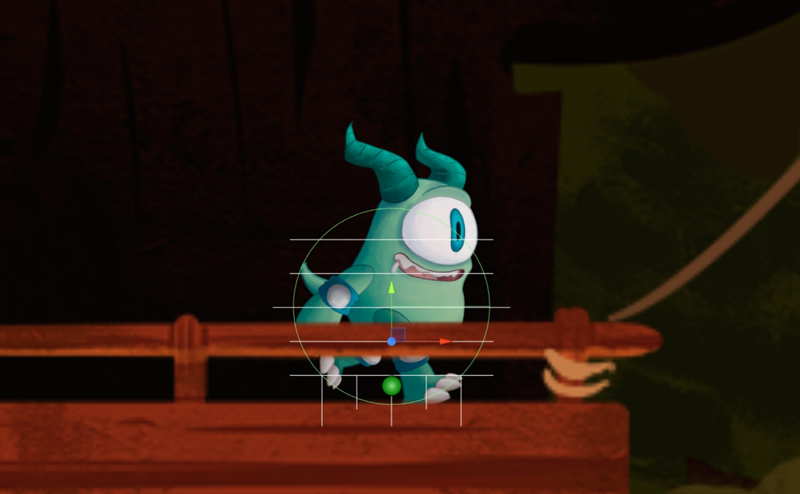 And an exception, we added the new Jack drowning animation (poor little devil). Along this line, we also worked in another aspect that was waiting there for a long time. To explain the game’s story some levels needed cinematic scenes and we started working to calculate how complex it would be. 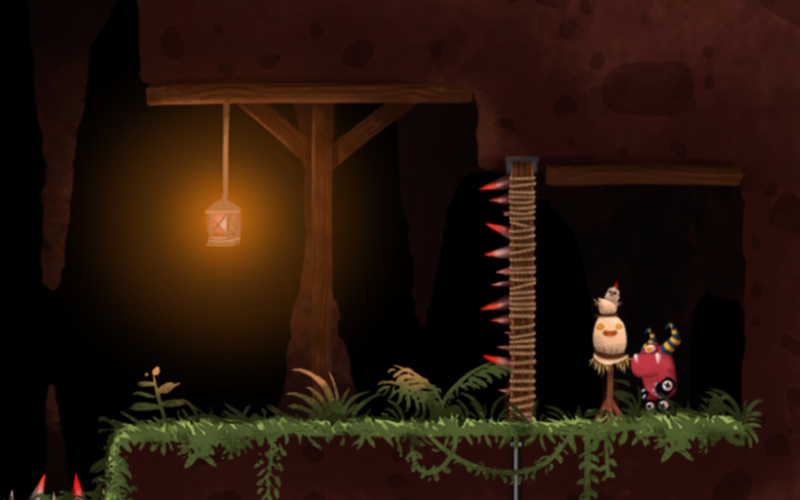 After some tests we implemented a zoom effect that we will use to focus the player’s attention in special points. We also added a camera shake effect, something that we curiously use also on some levels during play, not only in cinematic scenes. Our musician Matt sent us some tests for the OST, we can see a little sneak peak later ;). In addition to music, he creates the SFX, so we implemented different step effects to see how they sound depending on the floor material. As a last thing about game enhancements, we added particle effects, animated some background elements and added environmental effects like fog to transmit the desired mood for every moment in the game. But we worked not only in game enhancements, we also advanced in new features we need to implement because the next game worlds add new mechanics. We consider game feel so important that we changed a mechanic just because, although it worked, its readability was very bad when presented to the players. Then we changed steam pipes that propel the player for springs, easier to understand and widely known in the gaming collective imagination. Talking about game feel, we created a video showcasing how the game changed with every detail we added. Sometimes it may seem only a graphical enhancement, but it really helps and guides the player through the levels. Sometimes, something as simple as a blood stain is telling the player that there is a danger nearby, it’s not just an aesthetic resource. 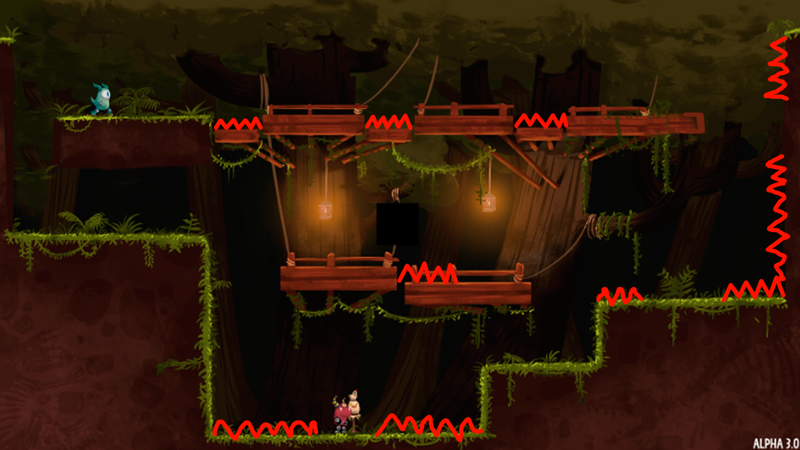 This month we asked for help to other developers because we had problems with Jack’s collision management when jumping. It happened only in some specific conditions, but it occurred enough times to be perceived by the players in playtest sessions. From the beginning we used a circle collider to detect what collides with Jack, and it worked well most of the time: when you collide with a wall, Jack flips; when you collide with the ceiling, Jack bounces downwards. But when you have a 90º corner, Unity3D seems to get into a mess and generates a very strange bounce. After lots of testing, we finally opted to implement a more complex solution. We wanted to avoid it because complicating the code will result in worse performance, but it seems there is no easy solution. Finally we added some horizontal and vertical raycasts that allow us to know in advance what is going to collide with Jack and act accordingly, detect the special case and prevent Unity to get into the mess. In parallel to the Story Mode the game will come with the Challenge Mode. It will present the playera harder version of the Story Mode levels. This August we started designing some of them. But it’s not the only mode we have worked on. Zombies Mode, where you will have to decimate waves of undead jellies, is starting to shape up and we have some test levels to playtest them. There are more pending topics, but we barely have them written down and you will need to wait a little bit to view something. For example, we have the routines for the bosses in their final form, their cinematics, the assets to be done and the animations that will be needed. And that was our August. I hope you liked to read how, step by step, Jack is nearer to the end of his story and you’ll be able to join him. September is ending, we are still working hard, so stay tuned. More news coming soon!